• Softstart feature entering the medium. 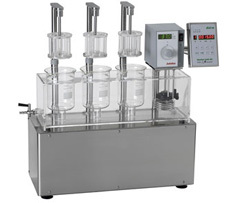 The USP/EP-conform DISI-Models are available with 1, 2, 3 and 4 test stations. All models are equipped with independently operating test stations, arranged adjacent to each other. The unique operating display allows a simple and efficient operation of all stations of the equipment. The remaining test time is continuously displayed. At the end of each test the test baskets are automatically lifted out of the medium and an acoustic and visual signal indicates the test end clearly on the operating display panel.